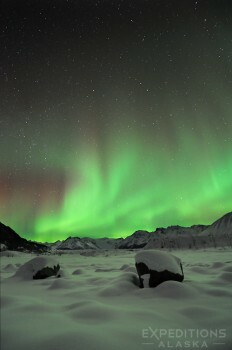 Wrangell – St. Elias National Park and the aurora borealis photo, or northern lights, Alaska. Please click on the image above to view a larger version of this photo. We’ve had some pretty great weather here through the month of February, and that means, a great time to get out and look for northern lights. Working on my own project, rather than photo tours, I was able to hit a few destinations I wanted to shoot that are a little more hit and miss; less reliable than some others, but places I wanted to shoot nonetheless. One of those places is Wrangell – St. Elias National Park and Preserve. Inevitably I’d be in the wrong place at the wrong time in a place slightly larger than the country of Switzerland; I’d head off in one direction and then have fog and haze cloud up the skies, or I’d head off in another direction, and the lights display would be directly behind me. The mountains in front me being what I want to shoot, and the lights behind me. Not a great mix. But, such is what happens when you have specific ideas in mind; it’s important to be flexible in nature photography, and particularly so when shooting the northern lights, but part of working on a project involves fulfilling your own ideas. Spontaneity is great, and I’m all for it. But I’m also interested in trying to make a photo of something I envision ahead of time, and working toward that. It’s a rewarding, but often frustrating endeavor. This particular night I spent the greater part of the night plaint solitaire, listening to my iPod, and waiting for something to happen. Too many nights I’d been skunked, heading out too late, and missing the greatest moments of too many brief northern lights displays. So here I went out before dark, and stayed out until sunup the next day. It was a long night, but I’m glad to have made the effort. For what it might be worth, an iPod or iPad or even iPhone is a wonderful tool for northern lights photography; something to do while you wait, and wait, and wait. And wait. This photo is looking north toward the Wrangell Mountains, of Wrangell – St. Elias National Park and Preserve. The lights display wasn’t the most intense I’ve seen, even that I’ve seen this year, but it was a grand display nonetheless. And, more importantly, I was where I wanted to be when it happened. This entry was posted in Alaska, Landscapes, Northern Lights, Winter, Wrangell - St. Elias National Park and tagged aurora borealis, Donoho Peak, Kennicott Glacier, Stairway Icefall, Wrangell Mountains on March 4, 2014 by Carl D.